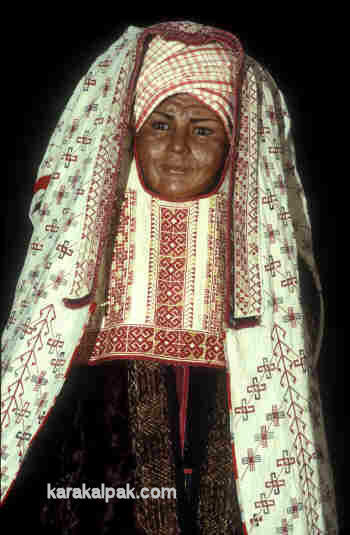 The Karakalpak jegde was an unlined mantle, which was worn draped like a cloak but was placed over the head rather than the shoulders. It had very long false sleeves, which were folded so that they hung down behind the back where they were fastened together at the cuffs by a short cord. 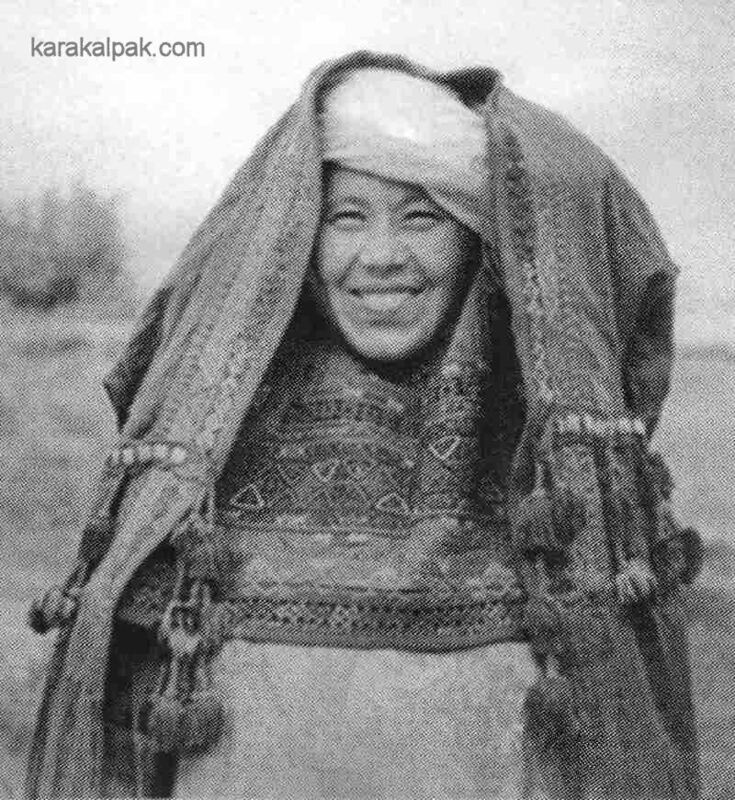 A Karakalpak woman dressed in a qızıl kiymeshek and a jipek jegde. Image from the fund of the Karakalpak Branch of the Academy of Sciences of Uzbekistan, No'kis. The jegde was normally only worn outside of the home. It permitted a woman to go about unveiled, but to retain some modesty by being able to use the side of the cloak to shield her face from male onlookers. 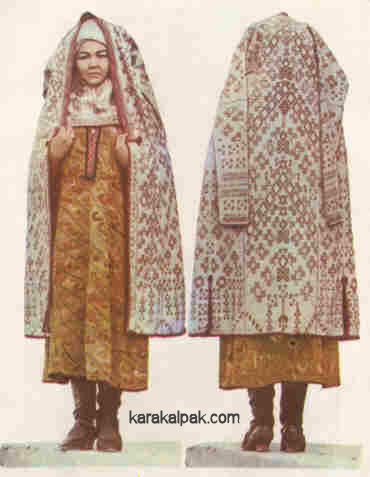 According to research, conducted by members of the Khorezm Archaeological-Ethnographical Expedition in the 1950s, Karakalpak jegdes were mainly worn for festivals, toy, and were not used for everyday wear unlike the cloaks worn by the Uzbeks and Turkmen. 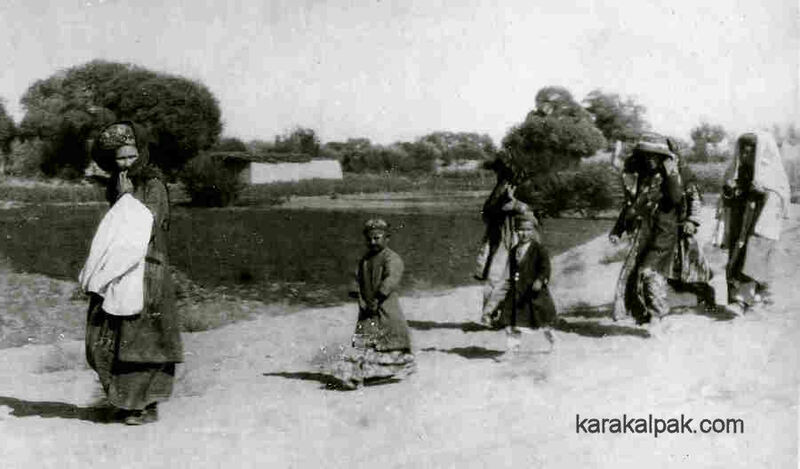 A procession of five Karakalpak women. The one in front carries her aq jegde, while the one at the back wears her aq jegde. Image courtsey of the Savitsky Museum of Art, No'kis. 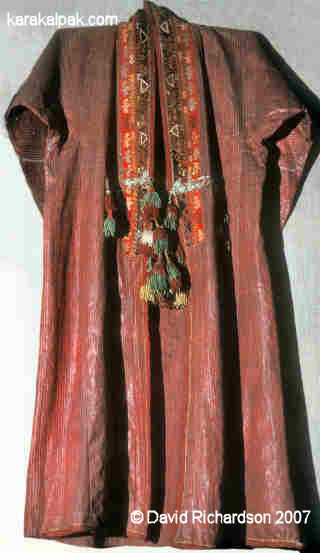 The jegde was not a traditional item of Karakalpak costume. Such garments were not worn by the Qazaqs and the Kyrgyz. 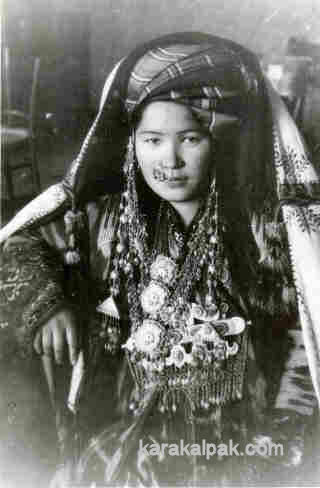 They were adopted by the Karakalpaks after they had migrated from the lower Syr Darya into the delta of the Amu Darya. Here they came under the influence of the southern Khorezmian Uzbeks, who wore the paranja, and the northern Turkmen, who wore the chyrpy. There were three main types of Karakalpak jegde: the jipek jegde worn by young married women or by girls of marriageable age; the aq jegde worn by mothers and middle aged women; and the kempir jegde worn by elderly women. The name jipek jegde means silk jegde, although most jipek jegde were made from narrow widths of red polished striped cloth known as alasha, woven from 100% cotton. Karakalpak alasha was very similar to the lilac, blue or brown-coloured Khorezmian Uzbek cloth known as alacha, but had a different colour composition consisting of narrow maroon red, black and white stripes. Like alacha, after weaving it was treated and polished by hand in local workshops using a very heavy wooden rubbing tool with a glass polishing head. Jipek jegdes were always unlined. Jipek jegdes had a collar made from red ushıga with an outer border of black ushıga. This was embroidered in chain-stitch and was made separately before being attached to the body of the jegde. The edges of the jegde including the collar were finished in raspberry red jiyek. Bunches of decorative red and green tassels were attached to the front, suspended from red and green braid. The long tapering sleeves were folded over down the back of the garment and fastened together at the cuffs with fine red and green cords. Detail of the jag'a of a Karakalpak jipek jegde. 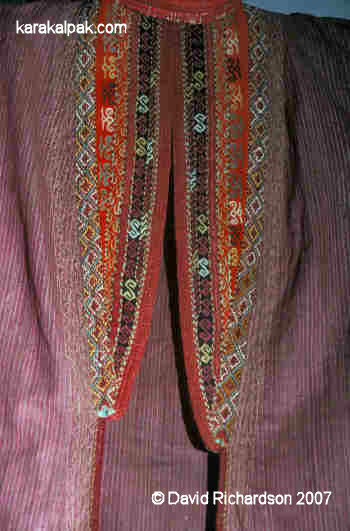 Jipek jegdes were worn by girls from about the age of 15 onwards, including newly married women. They seem to be a late addition to Karakalpak traditional costume, having been introduced at some time in the late 19th century and becoming increasingly popular during the first three decades of the 20th century. 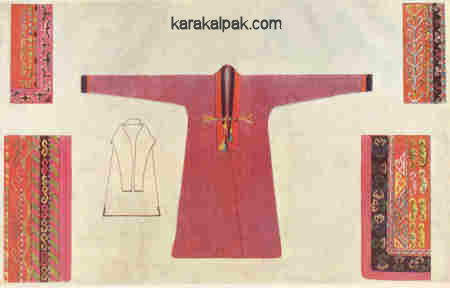 An illustration of a Karakalpak jipek jegde and some of the embroidery details. From the Works of the Khorezm Archaeological-Ethnographical Expedition, 1952. 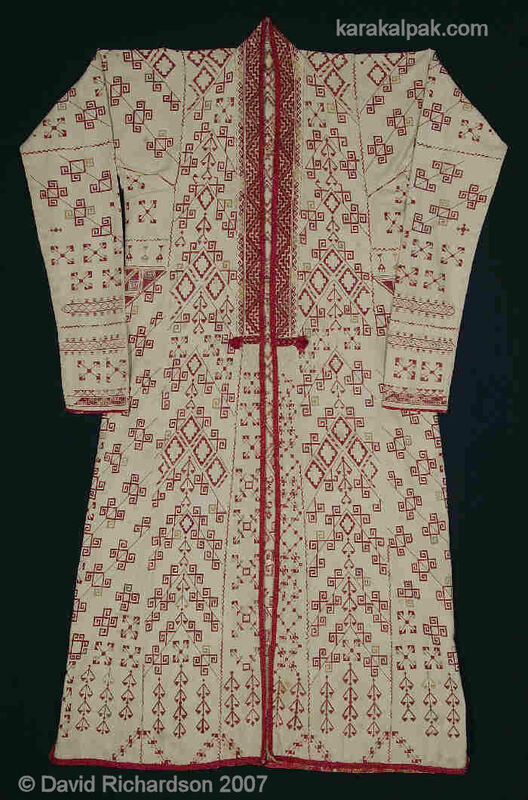 The aq jegde or white jegde was sometimes alternatively described as a kesteli jegde, meaning an embroidered jegde. They were originally made from lengths of undyed handmade fine cotton cloth, sewn together side to side. The cotton thread was first boiled in water with sorghum groats to made it stiff and to give it a yellowish grey tint. However later aq jegde were made from commercial machine-made white cotton fabric. Aq jegdes were always unlined. A Karakalpak woman modelling an aq jegde with the sleeves hanging loose. 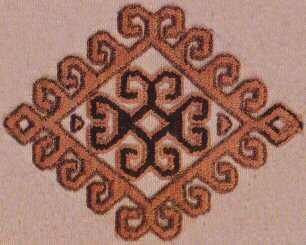 An illustration from Allamuratov's "Karakalpak Folk Embroidery". The entire surface of the aq jegde was decorated with a geometric pattern of cross stitch embroidery including the back and the sleeves. Usually the embroidery was based on a subtle palette of soft shades � raspberry pink or red, pistachio green, golden yellow and light cream. In addition, the joins between the cotton panels were overembroidered with omırtqa vertebrae motif or with a simpler zigzag. A separate collar, known as a jag'a, was made from a strip of coarse cotton bo'z, which was completely covered in tight geometrical cross-stitch patterning. The collars of later aq jegdes were usually made with a surrounding border of red and black ushıga decorated in chain-stich embroidery. Once again, the long tapered sleeves were folded down the back of the garment and fastened together at the rear using fine white cords and perhaps a small amulet. 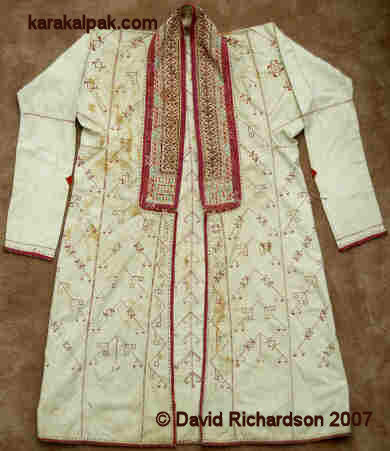 A fine Karakalpak aq jegde, with the sleeves folded in front. Image courtesy of the Savitsky Art Museum, No'kis. The edges of the aq jegde including the collar and cuffs were finished with raspberry red jiyek. 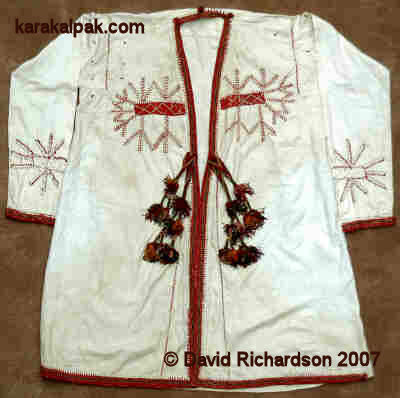 A Karakalpak aq jegde with a fabulous collar embroidered with the g'arg'a tuyaq motif. From the town of Qarao'zek. The Richardson Collection. Aq jegde were worn by women aged from about 30 to 50 years old. Usually the more complex the embroidery decoration, the higher the status of the owner. For ceremonial occasions and festivals the aq jegde would be worn over an aq kiymeshek and a white turban. A mannequin dressed in an aq kiymeshek, a shatırash oramal and an aq jegde. From a display at the Savitsky Art Museum, No'kis. The kempir jegde or old woman's jegde was like a simple version of the aq jegde. It was made from lengths of cotton sewn together side to side and was unlined. Although the collar was embroidered, the body of the jegde was left plain. A simple kempir aq jegde with a collar embroidered in cross-stitch and edged with ushıga. Made by a woman from the Mu'yten-Teli clan, who was born in 1886 in a village close to Xalqabad. As with the kesteli aq jegde, the main part of the collar was made from coarse cotton bo'z embroidered in cross-stitch. This was often surrounded by an edging of red and black ushıga decorated with chain-stitch. The edges of the jegde were finished with jiyek or red cotton. During the 1930s a new style of jegde appeared, somewhat like a cross between a kesteli aq jegde, a kempir aq jegde and a jipek jegde. Much of it was undecorated like a kempir aq jegde although it had a limited amount of embroidery decoration on the upper front and on the sleeves. Like the jipek jegde it had coloured tapes and bunches of tassels sewn to the front panels. The edges were finished in red jiyek. A model posing in the finest Karakalpak costume of the time and wearing the new style of aq jegde. Probably photographed in the 1930s. Image courtesy of the Savitsky Art Museum, No'kis. 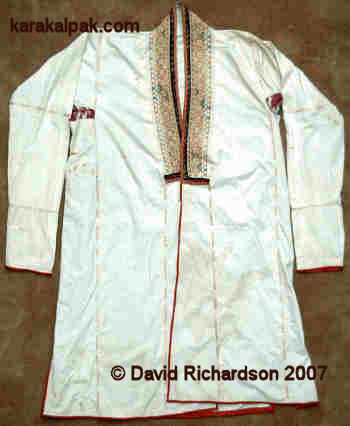 A modern Karakalpak aq jegde, made by Biybisara from the Irg'aqlı clan. She was born in the No'kis region in 1928 and made the jegde in 1953 at the age of 25. This was made at the very late date of 1953 by a woman aged 25. We know from the woman's daughter that her mother wore the jegde while she was still a young girl. This page was first published on 6 March 2007. It was last updated on 4 February 2012.